Russia is vast and big. Well, this not a new information. Russia is diverse for its culture, history and even nature. And it is the biggest country in the world. For tourists, this also means there are a lot of things to do in Russia. A lot of things to explore. Whether it’s the architecture, the ballet, the matryoshka, the food, or yes, of course, also for shopping. Russia is a good choice for shopping. Russian women especially are known for their stylish choice when it comes to fashion. Have you ever curious where do they shop the clothes they’re wearing? Of course, some of them are from factory outlets. And there are 5 Best central factory outlets in Russia for women to go to. Fashion in Russia is pretty much similar to the rest of Europe. Long skirts and blouses are favorites. And Russian women love to wear high heels! They like to stand tall. Coats and Jacket are also favorites since it’s cold in Russia. And the women love the good quality branded stuff as well as colorful clothes. There are so many things to buy in Russia. whether it’s low budget or branded items. But nothing beats factory outlets, they are affordable and not too expensive. On the other hands, they also offer classy and distinctive design. And also they offer many popular brands. Factory outlet in Russia is like anywhere else in the world. It is where a manufacturer or a brand sell their product directly to the public, no retailer whatsoever. The goods are fresh from the factory, hence the name “Factory Outlet”. And then there are several outlet stores usually are located in one place. The collection of these stores then called outlet malls. Because they sell directly from the factory to the public, the price can be very cheap. And it is certainly a good place to hunt discounted stuff! No wonder many loves shopping in Factory outlets. Many Russian women go here too. Although there are not many factory outlets in Russia, we’ve managed to curate 5 Best central factory outlets in Russia for you as a guide to hunt for some nice clothes. Vnukovo Outlet Village is located in Moscow. It is probably not the most exclusive shopping outlet in Moscow, but that’s why it’s popular. It is a popular destination for all kind of wallet owners. It’s an open outlet, with many shops inside. Shoppers will be satisfied with the range of brands being sold here. The brands are also diverse, such as puma, vans, furla, and Adidas. The collections are complete from shoes, clothes, and many more. The salesperson also helpful and friendly. If you’re lucky, you can also get some nice discount. If you’re hungry, there is a food truck available. Cafes and restaurants are available too. If you bring your kids, there is an activity park, and also a little zoo. So don’t worry to bore your children with your shopping activity. Even if you’re just walking here, the place is also beautiful for sightseeing. 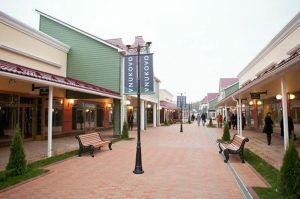 Outlet Village Belaya Dacha located in Moscow. It is very popular both for locals and foreign tourists. Branded stuff like Armani also has a store here, as well as more common brands like Nike. It is easy to reach from the city with taxi and uber. And if you’re tired, this place has a lot of coffee shops. After all the shopping, you must feel tired, right? So take a break at one of the coffee shops. Take a sip of coffee accompanied by a delicious cake. Enjoy your time while observing other shoppers. Maybe you’ll spot some nice Moscow’s street style, it can be a good inspiration for your own style. Another outlet village in Russia, but this one is in the historical city of St. Petersburg. So St. Petersburg is not only the right place for admiring the architecture. But it is also a nice place for shopping too. For branded products, there are several branded shopping center in St. Petersburg. Outlet Village Pulkovo has rows and rows of shops, ready for visitors to explore. There is a big Nike store here, and the price is competitive. Several other brands also have stores in this outlet. The outlets also have several restaurants. So if you’re hungry, you can stop and eat in one of the restaurants here. From outside, Fashion House Outlet Centre looks more like a castle than a shopping Mall. Do not get confused with Disneyland when coming to this castle outlet. Unlike other outlets, this place at least has a roof. It is the first fully enclosed rows of outlets in Russia. The interior has a nice design, and since it’s indoor, visitors will not need to worry about the sun on summer, or freezing to death in winter. The location is near the crowded Leningrad, so the traffic can be discouraging for some. But don’t worry, after getting out from the traffic, arriving and shopping here will be worth it. This is where you get branded stuff in Moscow at a reasonable price. The outlet center also has a wide parking lot outside. You might get bored with international brands on the factory outlets above. It is okay because local brands are also no less interesting. Outlet 11%11 is where you can find many famous Russian Fashion brands. There are a wide range of clothing and accessories, bor both Women’s and men’s. And the good news is, the prices are quite affordable. So go here and give this outlet a try. Now you know 5 Best central factory outlet in Russia. Prepare your wallet and some credit card to go shopping. Don’t get too carried away, and spend money wisely. Nonetheless, shopping in Russia is guaranteed to be a fun experience.